Here, and in the neighbouring village of Gildingwells, Methodism had some roots more than a hundred and fifty years ago. Services were held in the cottage of a John Harker at Gildingwells, and were supplied by Doncaster Circuit (Epworth Round?). Afterwards it had some association with Retford, probably at the time when Worksop was part connected with that circuit. 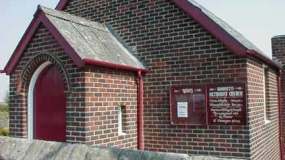 Methodism, however, appears to have had a chequered career as, on the face of the building which at one time served as a chapel, there was, and still is, a stone with the words 'Primitive Methodist Chapel 1823'. To return to past history: one of the first Methodists at Woodsetts, and at one time the only one, was a John Clarkson, whose son at the age of sixteen became a local preacher. It is said that the son specially invited his parents to a service one Sunday and they found to their surprise that their boy was the preacher! He continued as a local preacher for fifty years but had no connection with Wesleyan Methodism in the latter part of that time. The first record we have relative to this place is in 1829 when it is credited with four members. It disappears, however, under what circumstances cannot be told in 1841, and the services were taken up by the Wesleyan Association and continued until 1893 or 1894, when Woodsetts was left as a derelict. The good people, however, did not let the matter drop there, they secured preachers from "anywhere" but eventually Wesleyan local preachers, principally supplied from Anston, led after a six month's trial to Wesleyan Methodist services recognised by appointments on the plan in October 1895. In 1896 steps were taken to provide a chapel, land was secured and memorial stones were laid by Mrs James Turner of Anston, Mrs Presswood of Anston, Mrs Valentine of Worksop and Mr R H Goacher of Woodsetts. Funds at that time were £50. The opening services were on Thursday October l6th 1896. The preacher was Rev W Burgess of Sheffield, previously, for many years, of the Italian Mission in Rome. After a well attended tea meeting, addresses were given by Mr Burgess and the Circuit Ministers. The cost of the building was £360. The chapel was not opened without debt but by persistent efforts it was gradually reduced until at the anniversary held October 27th, 1914, amidst great joy, the announcement was made that it was extinguished; the newly appointed minister, Rev R E Grieves, being the minister on the occasion. Sunday school has been a feature of the chapel for many years. The first Sunday school was formed by Mr W Clarkson, uncle of the highly esteemed R H Goacher. From the sixties onwards Sheila White ran a thriving Sunday school and in the last few years a combined Sunday school with St George's has met each week in the hall under the guidance of Vicky Underwood and Val Coleby.